How do I sync a wallpaper to my Dropbox? How do I upload wallpapers? What wallpapers can I upload? How do I get my wallpapers removed? How do I setup rotating wallpapers? button on the settings page to connect to your Dropbox account. Click the "Sync to Dropbox" icon then choose the path to sync. That's it. If your Dropbox client is running, the wallpaper will be immediately synced to your Dropbox folder on your computer. If your Dropbox client is not running, you can also be see the result on your web browser by visit your Dropbox web interface. Use the Upload form, which limited the maximum file size to 10MB. 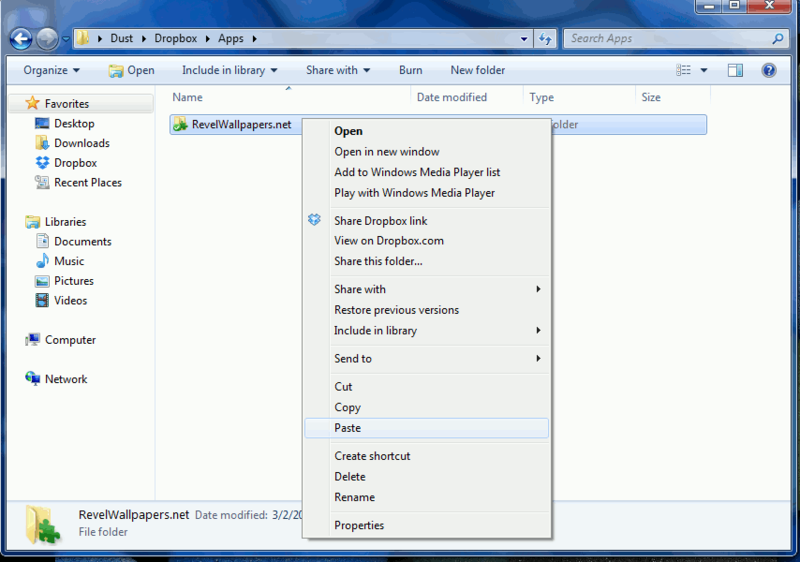 Upload wallpapers using Dropbox desktop application (client) without file size limit. Simply copy wallpapers to your RevelWallpapers.net folder, located in your Dropbox folder under Apps/RevelWallpapers.net. We will detect the changes and upload them automatically. 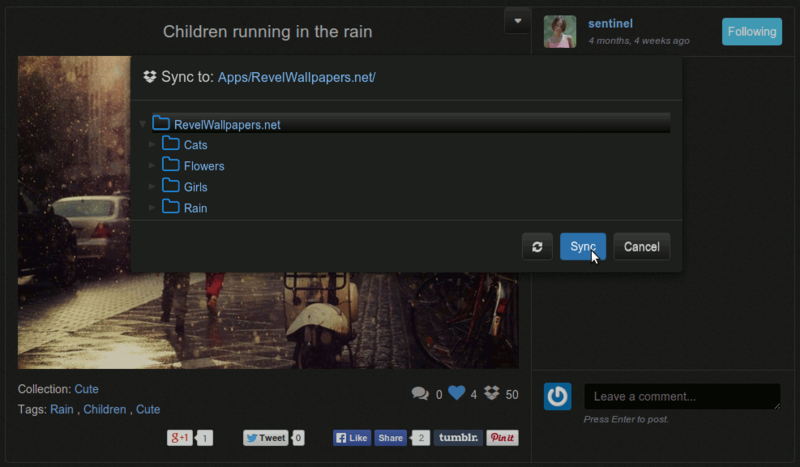 To upload wallpapers, just paste them to the RevelWallpapers.net folder. If your Dropbox client is not running, you can also use your Dropbox web interface to upload wallpapers. You should only upload a wallpaper if you are the copyright holder or if you have permission from the copyright holder to upload the wallpaper. We accept JPG/JPEG and PNG wallpapers that are 1024x768px or greater. The wallpapers violate the TOS will be removed completely from the site. 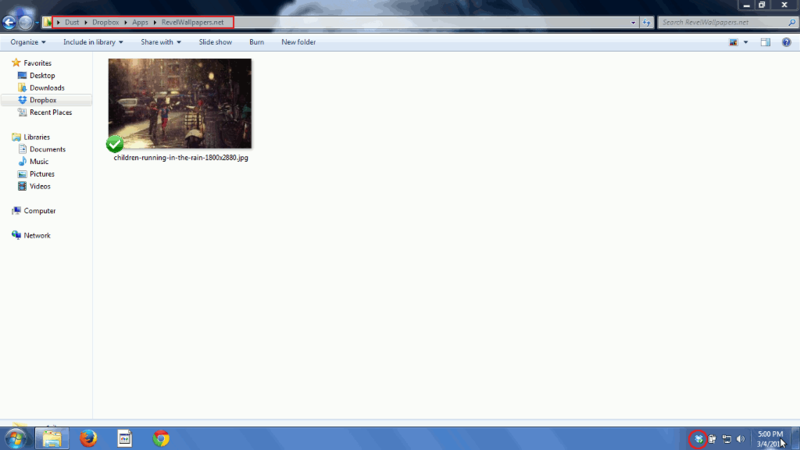 The copyright holder owns the wallpaper and not RevelWallpapers.net. We do not own any of the wallpapers, we simply host them and provide a service to easily share them. If you hold the copyright for a wallpaper hosted on this site and want it removed. Contact us to have it removed. Please provide as much proof as possible of your copyright over the image.